Defects in ion-implanted semiconductors are important and will likely gain increased importance as annealing temperatures are reduced with successive IC generations. Novel implant approaches, such as MdV implantation, create new types of defects whose origin and annealing characteristics will need to be addressed. 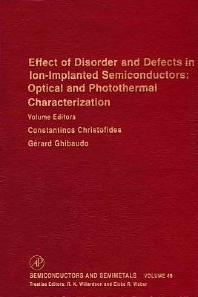 Publications in this field mainly focus on the effects of ion implantation on the material and the modification in the implanted layer after high temperature annealing. The editors of this volume and Volume 45 focus on the physics of the annealing kinetics of the damaged layer. An overview of characterization tehniques and a critical comparison of the information on annealing kinetics is also presented.